To relaxed lips, using the widest portion of the applicator, apply the desired color with a gentle even pressure. Move in one direction only. Do not blot. 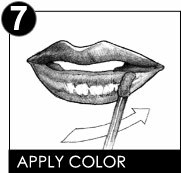 Applying LIP-INK COLOR to the inner portion of the lower lip can create the illusion of fullness. LIP-INK COLOR will adhere to areas where ordinary lipsticks will not. LIP-INK COLOR is more effective when applied in thin layers as opposed to thicker layers. The slower the application the more color is absorbed. You may finish with a coat of Lip Ink Classic Shine if desired. 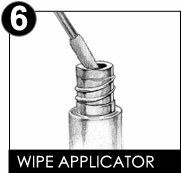 IMPORTANT REMINDER: Upon first application of our classic LIP-INK® Color™, to ensure proper color, you must first wipe the tip of the applicator. 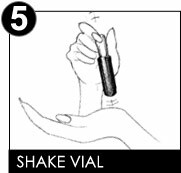 Remember to open the vials carefully, as LIP-INK®'s formulas are LIQUID. They can spill, or splatter and when in contact with clothing, carpet, etc. may stain. 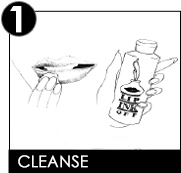 NOTE: LIP-INK® products may tingle, this reaction is normal. The sensation is due to the natural herbs and botanicals. The LIP-INK® waxfree, guaranteed smearproof & long-lasting, multi-patented color product line is not compatible with any other cosmetic products. LIP-INK® Color Cosmetics are based on scientific research and are protected by U.S. and International patents. Competitive products cannot legally duplicate LIP-INK® Color Cosmetics and their precise chemistry. New customers should start with a kit when purchasing any of our guaranteed smearproof color. The codes that appear randomly on color and shine vials provide Internal QC information only. © 2013 LIP-INK® International, or a division of LIP-INK® International. Hand-crafted, made in U.S.A. May be covered by one or more of the following U.S. Patent Numbers: 5747017, 6001374, 6010709, 6027739, 6203809, 6395263, 6509009, AU 701794, AU 736718. Quick shipping amazing product will be buying many more colours!! Highly recommend worth every penny!! Great for weddings and other occasions where beautiful long lasting lips are mandatory. Love the Vegan product and try to use chemically free products whenever possible. Great color selections and stay on power. Everything in one pkg. for beautiful lips. I use many colors and overlay also to create new colors. I wore lipstick very rarely, because of the need to reapply. Also, many brands tend to chap my lips. Love this product, I know wear lipstick everyday!! !